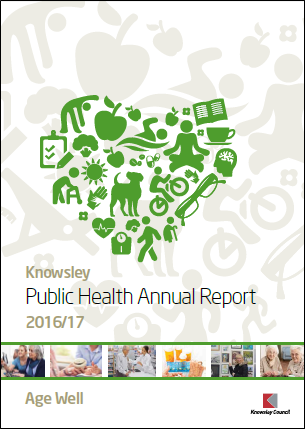 Knowsley Public Health has published its Annual Report for 2016-17 (July 2017). This year’s report is the final in a series of four life course themed Annual Reports, with the theme on this occasion being ‘Age Well’. The report focuses on older adults aged 65 and over and details some of the great work that is being done locally to address the needs of older people. KOPV is delighted to have been a major contributor to the content, and to be featured among the range of initiatives, activities and publications that local partners provide. Click on the image right to download a copy of the report (pdf 5.8MB).